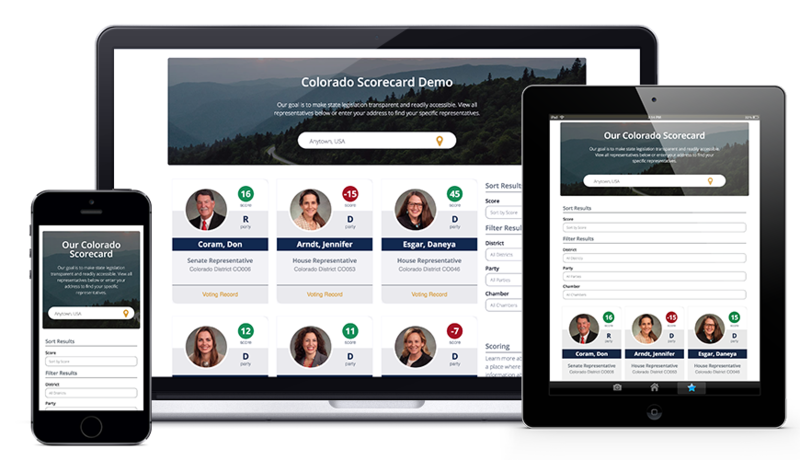 We created the Legislative Scorecard WordPress plugin to help advocacy groups add scorecards to their websites in an easy-to-use, appealing format. Our plugin connects to the Bill Track 50 API, pulls in scorecard info (bills, scores, comments, and legislators), and displays this on the user’s WordPress website. We auto-populate everything, including official legislator headshots, to make this as seamless as possible. Use Bill Track 50’s scorecard tool to choose a set of bills and score them. Bill Track 50 takes care of totaling the scores for each scorecard, tracks how legislators are voting, and scores them based on the user’s scores for each bill. The user installs our plugin, which connects to the Bill Track 50 scorecard of their choice and pulls in that data. The user’s scorecard data is then displayed on their WordPress website, just like you see in our legislative scorecard demo. Whenever they update their Bill Track 50 scorecard, our plugin takes care of pulling in that updated data into the user’s website. Visit our product website at http://legislativescorecard.us/ to view our demo. The demo connects to Bill Track 50’s API to pull the latest information for each legislator. However, all scores and comments are created for demo purposes only. Forward Kentucky uses it to display their visual legislative scorecard. To read more about how they are using this, view their press release. You must have a Bill Track 50 account to use this plugin. We work closely with Bill Track 50, so if you’d like us help you get set up with an account, please contact us. If you have a Bill Track 50 account with scorecard already, you’re welcome to purchase directly from our pricing page. Then, we’ll contact you to send your license key. Otherwise, contact us with any questions.